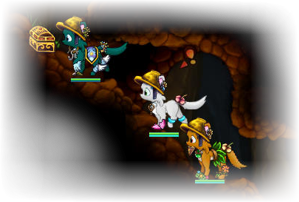 Paw'D is a free-to-play, massively multi-player online role playing game (MMORPG). It takes place in the Kingdom of Elyssia, which is threatened by an onslaught of demons from the plane of darkness. You step into the paws of a brave little creature that stands up and fights against the monsters, to restore the kingdom to its former peace. You do not have to fight alone, though. When you play, you and everyone else who plays share a single, large game world. You can be a lone warrior that fights their way through the dangerous jungles with only their claws. Or, you could team up with other adventures - players just like you - who you meet along the way, and forge a bond of skilled and steeled heroes that best the toughest challenges together. And of course, you can also bring your friends and your siblings to help. Right now Paw'D is still a new game, so you might not meet a whole lot of players at once, however anyone that plays at the same time as you is in the same world - somewhere. 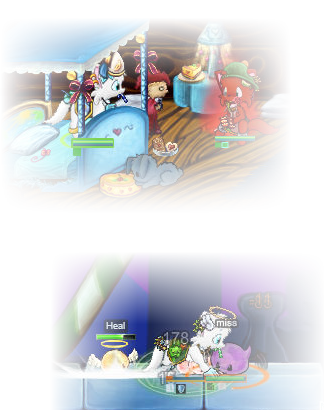 Since you play with anyone else who is on Paw'D in a common world, there is no offline mode of the game. Because of that, you need to be connected to the Internet to play. You do not need to install anything (beyond having Adobe Flash) - we run anything necessary ourselves, and we make sure everything works. In Paw'D, you and other adventurers assume the role of different classes, ranging from warriors, over mages to priests. Each role has their own, unique abilities, many of which complement the abilities of other roles. By joining forces with other adventurers, you become an unstoppable team, ready to face the darkest and fiercest monsters of Elyssia. From the peaceful and calm meadows of Saliko, over dense forests, dangerous jungles, deep caves with underground lakes, to snow-covered mountains: the Kingdom of Elyssia is vast, and covers a large range of different environments. Explore them for rare herbs, forgotten treasures, or simply enjoy the hand-drawn scenery. Numerous monsters inhabit the game world that you can interact with. Some will simply go their merry way, while others will chase after you as soon as they spot you. The battles against the environment (PvE) can range from simple fights against a single creature that claws at you, to complex, multi-phase boss battles with several players. Don't worry though, not all monsters are evil - some may even help you in your quest. 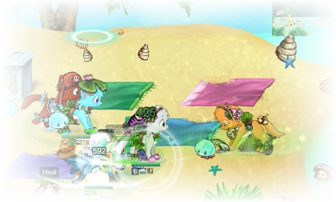 Just like you can battle monsters, there are also dedicated areas in which you can challenge other players and test your skills against them. Along with simple free-for-all PvP areas in which anyone can attack anyone, we have team-based battlegrounds that include Capture the Flag, King of the Hill, Castle Defence and Guild Battles. A powerful matchmaking system automatically creates the teams for you while considering each player's performance, and lets you know when everyone is ready - all you need to do is queue. 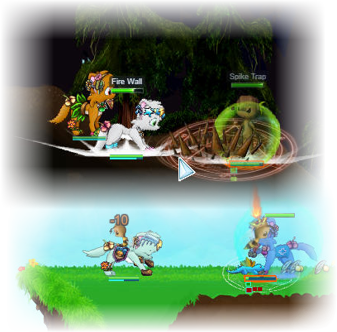 Paw'D has deep and carefully designed combat mechanics that are easy to learn, but difficult to master. You won't have any troubles winning your first fight, and soon you'll be standing up against hordes of wild creatures. However the true challenges are still ahead. Elyssia is littered with dungeons that range from small caves, to massive, seven-floor ruins. Filled with powerful monsters several times stronger than the creatures outside, many dungeons require a group of adventurers working together to uncover their most valuable and sought for treasures. Paw'D offers hundreds of trophies that you can obtain for outstanding or unusual feats. Are you the alchemist that all your friends depend on for potions and elixirs, or did you just beat a really tough boss and have the scars to prove it? Trophies come in all difficulty levels, many of which add an extra twist on existing gameplay that make it more interesting and challenging. Some trophies even reward you with titles and pets that cannot be obtained in any other way, or providing you with extra bits of backstory that you would otherwise not see. Socialize with your friends and fellow adventurers in guilds, complete against huge world-bosses, or create your own game-world from existing scenery and your own drawings: only the sky is the limit if you would like to get involved!